Makey Makey – An “invention kit for everyone,” Makey Makey should be a part of any tinkering classroom. Makey Makey creates a simple alligator-clip-based interface between the computer and everyday objects. It plugs into the USB port of any computer, even a Raspberry Pi, and turns household objects into a keyboard or joystick. The website has many projects, videos, lesson plans, and resources. 20 Makey Makey Projects for the Evil Genius – Go beyond the banana with projects for beginning to advanced makers by Aaron and Colleen Graves. Instructions are easy-to-follow with detailed photographs. Arduino website – Open source electronics prototyping platform and robotics controller for interactive projects. 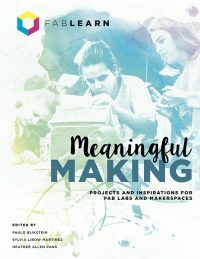 Make Magazine Arduino – Videos, project ideas, how-tos, kits, parts, and blog posts about what people are doing around the world with the Arduino. Adafruit Arduino Lessons – Free online series of lessons for beginners written by Simon Monk. Instructables Arduino Projects – A curated collection of Arduino projects at varying levels of complexity from the editors at Instructables. Getting Started with Arduino – A handy little guide to getting started on Arduino by Massimo Banzi, one of the inventors of the Arduino. Arduino Project Handbooks – Each of these two volumes by Mark Geddes has a getting started guide, plus 25 projects for Arduino beginners. Projects include step by step instructions and well-chosen close up color photographs. The volumes cover different skills and components, so buy both! Sylvia’s Super Awesome Project Book – Super Simple Arduino! – YouTube star Super-Awesome Sylvia introduces young makers to programming and hardware using the Arduino microcontroller. The Arduino Inventor’s Guide: Learn Electronics by Making 10 Awesome Projects – Good Arduino project book by Brian Huang and Derek Runberg that focuses on building skills in electronics. Making Things Talk: Using Sensors, Networks, and Arduino to See, Hear, and Feel Your World – Sophisticated but very cool networking projects using sensors and microcontrollers. Arduino IDE – The Arduino Integrated Development Environment (IDE) is downloadable software used to program Arduino boards. Arduino Create – Online hub for Arduino projects, a cloud-based coding environment, and circuit design. You must still download and install a plug-in, but it means you always have the latest version. There is a subscription service available for schools to integrate it into Google Apps for Education. S4A (Scratch for Arduino) – A version of Scratch intended for programming and controlling an Arduino microcontroller. Snap4Arduino – Snap4Arduino is a modification of the Snap! visual programming language that lets you seamlessly interact with almost all versions of the Arduino board. iForge Genesis – A free browser-based block language to program Arduinos. There is also an iOS app as well. Programming Arduino: Getting Started with Sketches – By Simon Monk. Clear, easy-to-follow downloadable examples show you how to program Arduino in C. This is a must have book for learning to use the Arduino. Adventures in Arduino – A beginner’s guide to Arduino programming for ages 11-15 by Becky Stewart. Micro:bit Foundation – A non-profit organization supporting the BBC micro:bit, a versatile microcontroller board. Resources for students, teachers, developers, and an online community. Micro:bit Go kit – Get started with micro:bit for around $15 (US). You get a micro:bit, battery box, 2 AA batteries, and USB cable. Micro:bit magazine – Free online magazine about the BBC micro:bit. Getting Started with micro:bit – Online tutorial from Sparkfun for the BBC micro:bit. BBC micro:bit Kitronik University – Extensive online tutorials, projects at all levels, and teaching resources for the BBC micro:bit. Kitronik is a UK-based vendor and also a partner in the development of teaching materials and expansion boards for the UK Design and Technology curriculum for Year 7 students. Getting Started with the BBC Micro:Bit – This is one of the better introductory books for the BBC micro:bit. Chibi Chip (Love to Code) – Love to Code is a microcontroller board packaged with a fun graphic book introducing coding and electronics. The system works with the Chibitronics circuit stickers, and can be programmed with a number of languages including MakeCode. It can also be programmed from your smartphone for ultimate flexibility. Getting Started with Adafruit Circuit Playground Express – An introduction to building projects and programming the Circuit Playground Express. The content on working with MakeCode is very good. Microsoft MakeCode – A free block-based programming language for a growing list of microcontrollers. MakeCode runs in the browser with a simulator showing your hardware device. The website has tutorials and project ideas. MicroBlocks – A visual programming language that runs directly on various microcontrollers. Micro Python – A version of Python can be used with the micro:bit. art:bit – Program the micro:bit display from a Chromebook. Micro:bit Programming Options – The micro:bit has a number of programming options including Scratch, App Inventor, and art:bit. This site has the complete list of options. Arduino IDE for micro:bit – Follow this detailed tutorial from Adafruit to use the Arduino IDE to program the micro:bit. It’s a bit complicated (but not difficult) and you will be able to use the global library of Arduino sketches as a start for your micro:bit project.